In the latest iOS 6 beta version, Apple has integrated a nice networking feature, called Wi-Fi Plus Cellular. As soon as the final build arrives, this new iOS 6 feature will allow millions of users to optimize the use of the data traffic while making no compromises for the whole experience. In a few words, Wi-Fi Plus Cellular adds a method of allowing applications that are having trouble with the Wi-Fi connection to use cellular data instead. This iOS 6 feature has a main toggle button from which the user can shut it down for the whole system or, using individual options, this can be personalized for every application in part. Just like in the picture, the user can rely on this new setting for syncing apps like iCloud Documents, FaceTime, Reading list, iTunes and pretty much everything that uses data transfers. Speaking of FaceTime, the same picture reveals that Apple will indeed allow FaceTime calls over cellular data, as long as carriers permit it. Once again, the setting was only implemented in a beta build of iOS 6 and may be removed until the final version. Hopefully, the Wi-Fi Plus Cellular feature will make the final build, as it sounds pretty helpful. 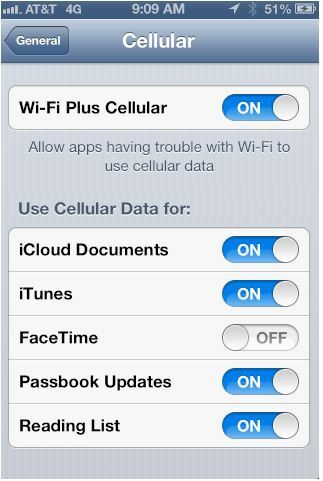 Would you use the Wi-Fi Plus Cellular feature when iOS 6 arrives? Let us know in the comments below.